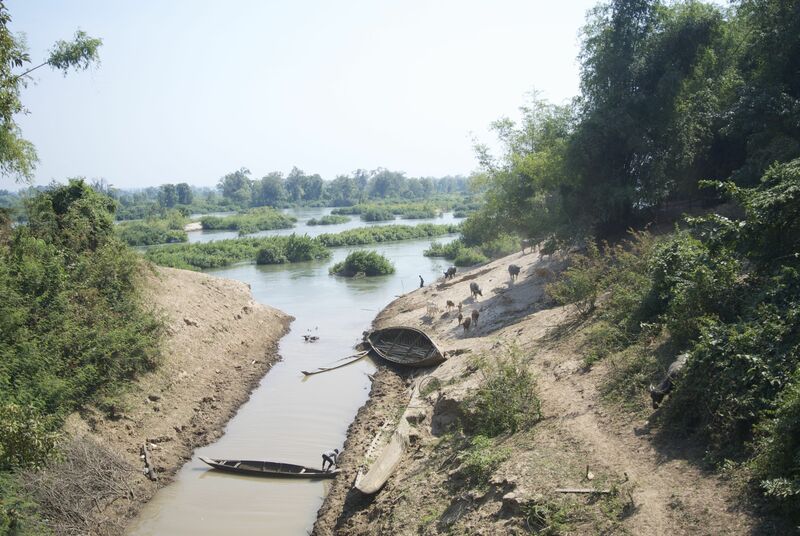 Boats and buffaloes along the Mekong River. I know they’re talking about me, but it doesn’t really matter as long as this is the place for the ferry across the river. I’ve got my mountain bike that I rented from Cambodia Rural Development Team (CRDT – a local non-profit) and after backtracking for a few minutes, I think I’ve found the town of Thom where I can take the ferry across the Mekong river and continue my trip. A group of people is standing around with motorbikes parked on the bank, so I figure this is probably the right place. After a while I become boring as a topic of conversation and people go back to chatting about something else unknown to me. The ferry comes and I load on with everyone else so I can then turn south and head back towards Kratie, where I started this morning. 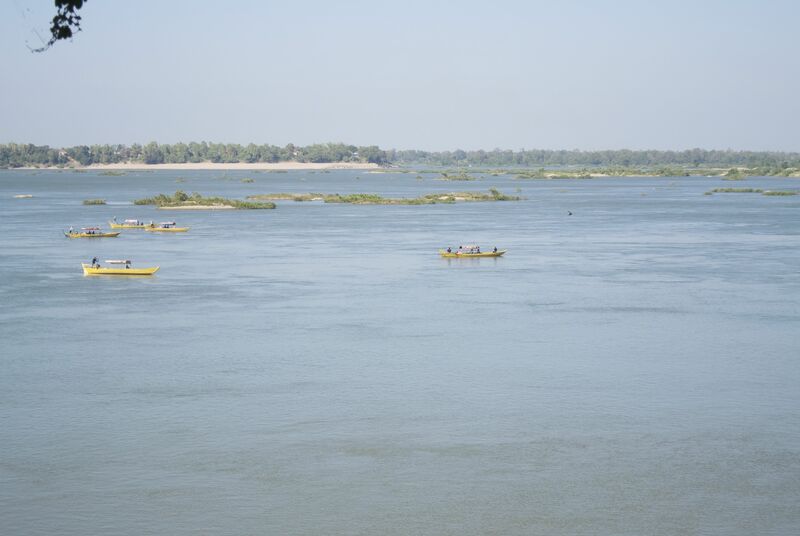 I had stopped in Kampi to see the rare Irrawaddy dolphin, numbering under 90 in the Mekong. We go out on a boat, chase after a few of them, and get a few glimpses of them swimming around. I’m satisfied. North of Kampi, on the “Mekong Discovery Trail” I don’t see any other foreigners on the road. I ride through villages, children waving and yelling “Hello!” as I pass by. I pass packs of school kids on bicycles and am overtaken by innumerable motorbikes. Heading south on the west side of the river the road is all dirt and at points empty of any other vehicles for several minutes at a time. As usual, I get puzzled looks from adults watching me peddle by, and waves from the children. I don’t stop very often, only to have some water or to snack on some peanuts or pastries that I got at the market that morning in Kratie. In Kampi, where yellow boats take people out to get a glimpse of the river dolphins. Kratie is a nice town on the river with a nice public market and a restaurant on the adjacent corner owned by an expat serving good Khmer food. I have a pastis before my curry and rice and watch the lights go on at the market as motorbikes come and go about the food stalls. My hostel is cheap for $2/night, but the mattress on my dorm bed is about the same thickness as the book I’m reading. The bike ride was 50K so the next day I don’t plan on doing much. I’ve heard Koh Trong Island is nice, and just a short ferry ride. There people rent bikes and ride around the island. I suspect that it won’t be much of a new experience, given that I was riding around the previous day but I go anyway. I rent a $1 bike that is completely worth $1. The pedal arm detaches within 10 minutes and the scenery is nice, but more of the same from the previous day. I take a shortcut and return my bike to the lady that rented it to me. I tell her the pedal is broken and she doesn’t seem to care. I don’t care either. The ferry ride back is short but it’s a nice day and I enjoy it. I find a hammock at a rooftop bar and restaurant and take a nap. I have my sights set on the ruins at Angkor, which means a trip across Cambodia to Siem Reap. I wait around in an almost empty van for a while until people start to pile in; we pick up a few people around town, and then leave Kratie around full capacity. The luggage is strapped to the rack on the back bumper. We pick up more people along the road and when we stop to tie a motorbike to the back along with the luggage I get out for a toilet break. Altogether, we’re twenty adults, two children, and a driver inside the van that would “comfortably” seat eighteen, and another two people riding on the motorbike that’s tied to the back. It’s a long bumpy ride, but I feel comfortable in my customary spot in the back corner on top of the wheel well. This entry was posted on February 2, 2015 by alexjparton. It was filed under Asia, Cambodia, Travel and was tagged with asia, bicycles, bus travel, cambodia, cambodia rural development team, CRDT, ferry ride, irrawaddy river dolphin, kampi, kratie, mekong discovery trail, Mekong River, pastis, ride bikes.